^ Croatie, Czech, Hungarian, Romani, Slovak, an Slovene are offeecially recognised bi the European Chairter for Regional or Minority Leids (ECRML). ^ Austrian schilling afore 1999; Virtual Euro syne 1 Januar 1999; Euro syne 1 January 2002. ^ The .eu domain is an aa uised, as it is shared wi ither European Union member states. Austrick (German: Österreich, Czech: Rakousko, Slovenie: Avstrija; Croatie: Austrija; Serbie: Аустрија; Hungarian: Ausztria) is a laundlockit kintra in central Europe. It haes a laund mairch wi Germany an Czechie tae the north, Slovakie an Hungary tae the east, Slovenie an Italy tae the sooth, an Swisserland an Liechtenstein tae the wast. Austrick haes been a member-state o the EU sin 1995. 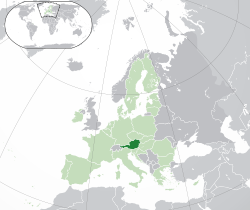 The fowk in Austrick speak German, a few speak Hungarian, Slovenie an Croatie. The caipital o Austrick is Vienna (Wien). Austrick is mair nor a thoosand year auld. Its history can be follaed tae the nint century. At that time the first fowk muived tae the land nou kent as Austrick. The name "Ostarrichi" is first scrieved in an offeecial document frae 996AD. Syne this wird haes developed intae the Modren German wird Österreich. Austrick wis an empire frae aboot 800AD tae 1918, an wis ringit ower bi The Hoose o Habsburg for maist o that period. Than it becam a republic. The First Republic wis frae 1918 tae 1938, the Seicont Republic haes been frae 1945. Frae 1938 tae 1945 Austrick wis pairt o Germany. It wis annexed bi the Nazis an becam pairt o the"Third Reich" juist afore WWII. Efter the weir it syne becam unthirlt. Wikimedia Commons haes media relatit tae Austria. This page wis last eeditit on 4 Julie 2018, at 18:52.